So cool. So in demand. Hands up if you want one! This head-turning tool is THE way to make your point. Eye-popping patterns and a dramatic coloured topper: now nobody can ignore what you say. Answer questions with it, point things out, or ask for stuff you want. You can play games with it. You can poke pesky siblings with it. If you’re really revolting, you can even pick your nose with it. The ultimate prop for classroom show-and-tells – and all kinds of cheeky fun! The absolutely amazing hand pointers are brilliant for learning and great fun I would definitely recommend them. My 6-year-old daughter wanted these from the school book fair, and so did my three year old. So I bought two. My son’s lasted half an hour. I was upstairs getting dressed and magically when I went downstairs the hand had been ripped off the stick. 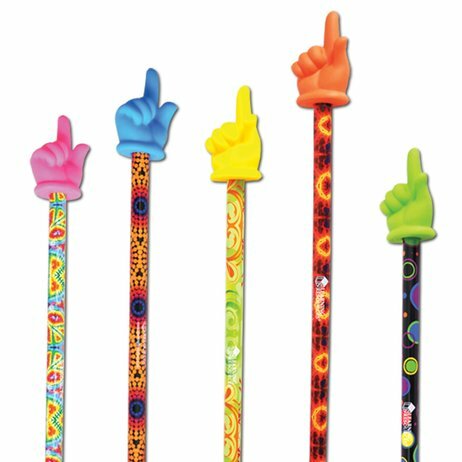 In other words, children love these pointer sticks but the sticks are not really built for lively children. it is so great and you can play with that! I was reluctant to buy this for My child, but am so glad I did she loves it & uses it to play teachers with. She keeps taking it to her dad & it doesn’t come bk so am ordering more to have at mine. At this price I don’t mind the extra purchase. I love these hand pointers there amazing I bought one from my schools book fair and loved it since I got it! I got this as a wee extra for my child as well as a few books. He loves it and uses it not only to point but to poke and prod at things too. At the price too its a great gift. I facilitate craft and singalong classes and use these pointers for a lot of songs. Put your finger on your head, cheek, ear etc (to tune of ‘if your happy and you know it’) ‘Wind your Bobbin’ and we even use it for Horsey Horsey instead of reins. However they are best used with parental supervision though as the little white disc has come off at the bottom so could constitute a choking hazard. I loved it but my brother or sister broke it in half! I was so mad! It was ok it is good if you can find something to do with it!